After losing the first day’s racing to the weather, day two of the BMW J/24 European Championships at Howth today (Tuesday 13th) saw one race completed in fresh and gusty south-westerly winds and witnessed a win for the defending champions (and current British champions) ‘Serco’ (Bob Turner) with Nathan Batchelor on the helm. 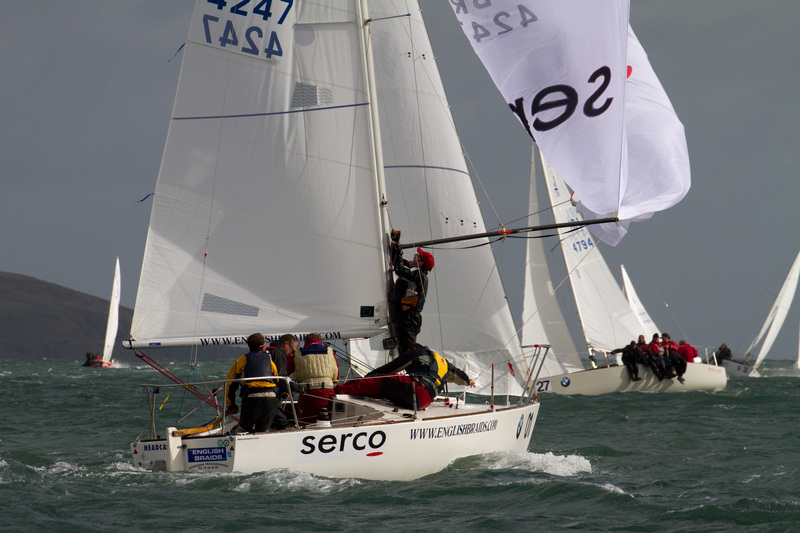 The 42-boat fleet got away at the second time of asking in winds touching 30 knots and it was the right-hand side of the course which was favoured, with ‘Serco’ leading around the windward mark. The downwind leg proved precarious for several boats who struggled with spinnakers in the gusty conditions, with sail damage forcing a number of retirals. By the end of the second beat, another British boat, ‘Il Riccio’ (David Southworth/Chris McLaughlin) had taken over the lead but as a shredded spinnaker put paid to their chances of victory and dropped them back to 5th. 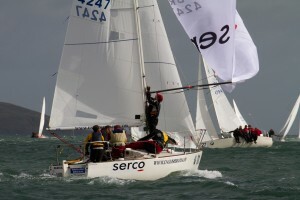 ‘Serco’ took the gun ahead of another British entry ‘Madeleine’ (McCarthy/Phelps), with German boats filling the next two spots, with ‘Max Bahr’ (Stefan Karsunke) and ‘Rotoman’ (Kai Mares) 3rd and 4th respectively. 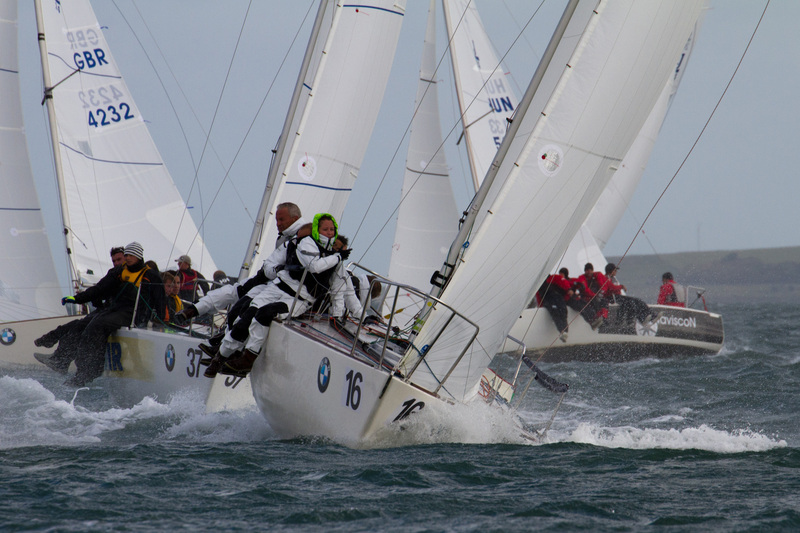 Four German boats finished in the top eight while 9th place went to the highest-placed local boat, Irish champion Flor O’Driscoll and crew on ‘Hard on Port’. 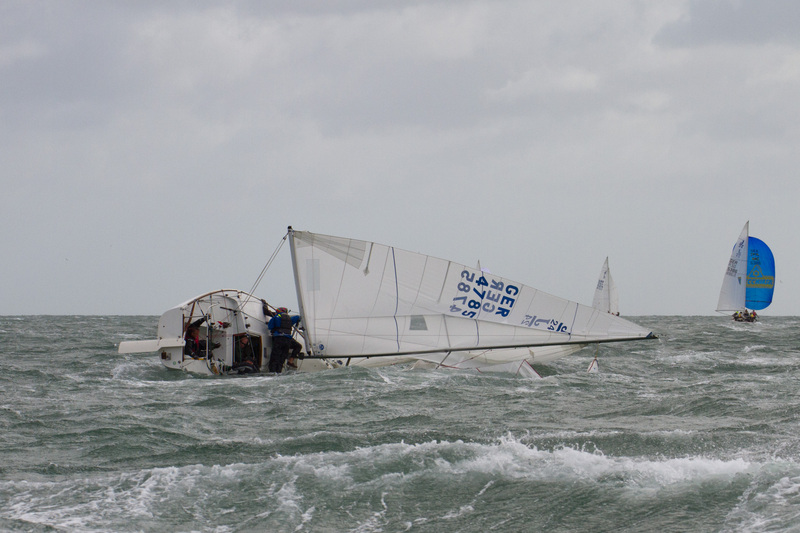 With winds forecasted to increase later in the day, the fleet was sent ashore and a subsequent decision by the Race Officer David Lovegrove and his team confirmed that the conditions would not allow any further racing on the day. It is hoped to run up to five races back-to-back on Wednesday (14th).